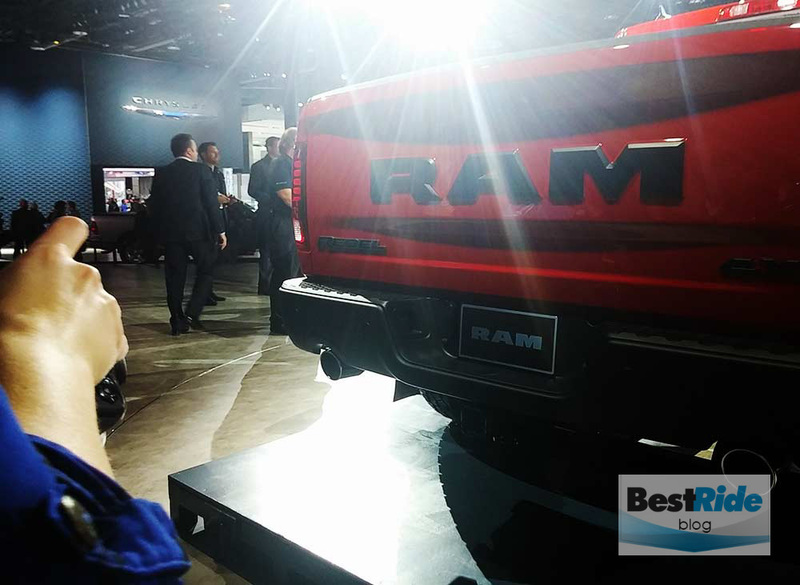 Trucks today are lifestyle vehicles; witness the nine trims of the Ram pickup, from Tradesman to Lone Star to Limited. 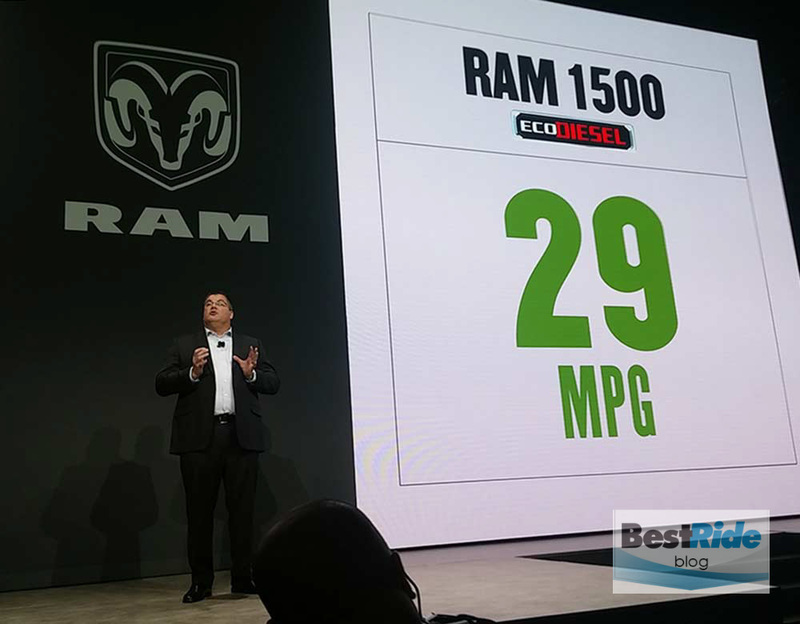 Make that ten with the debut of the Ram 1500 Rebel. 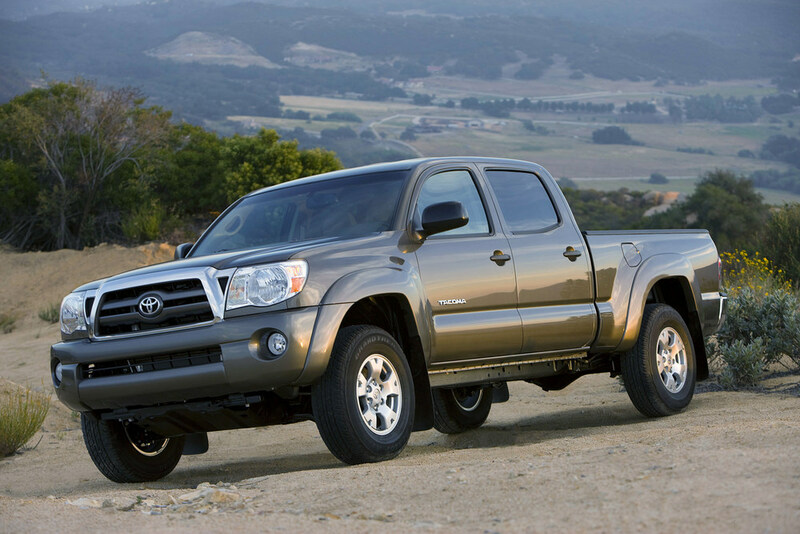 Ten is also a number to relevant to ground clearance, as the Rebel has the best-in-class 10.3 inches. Clearly, the Rebel wants to help you kick up some mud. 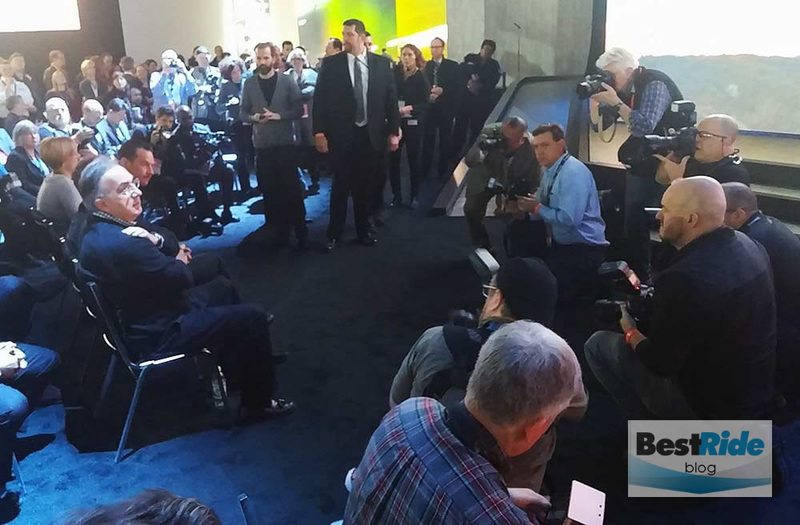 Then like the rest of the media, I noticed Fiat Chrysler Automobiles CEO Sergio Marchionne sitting nearby. Hmm, there might be something to this after all. 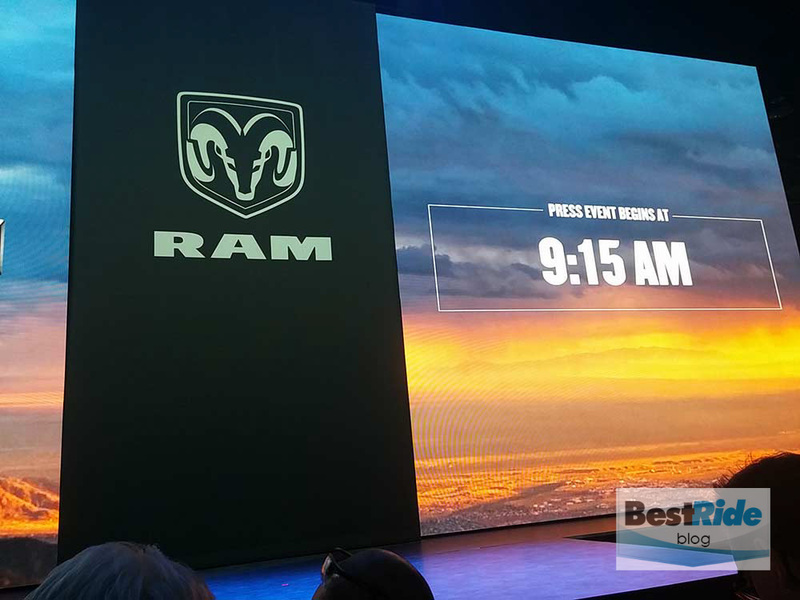 Bob Hegbloom, President and CEO of the Ram Truck Brand started out by extolling the economy of Ram’s EcoDiesel engine. Then with some of the best dramatics of the show, the Rebel debuted on a vertical plane. Slowly it made its was horizontal. 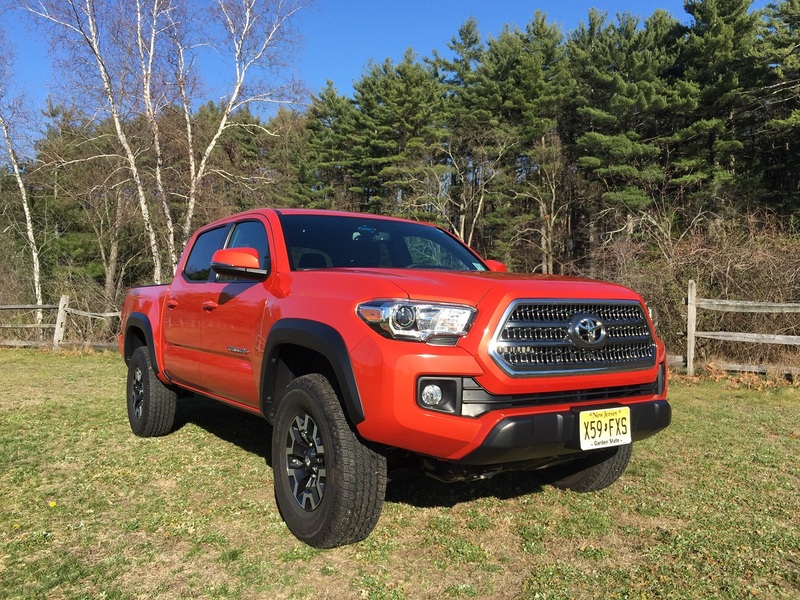 Hegbloom touted the ride height and the “can-do” attitude of the Rebel’s demographics (much like those of the 2016 Toyota Tacoma TRD and 2017 Ford Raptor that debuted this year as well), and then it was time to get a closer look. First we went underneath. 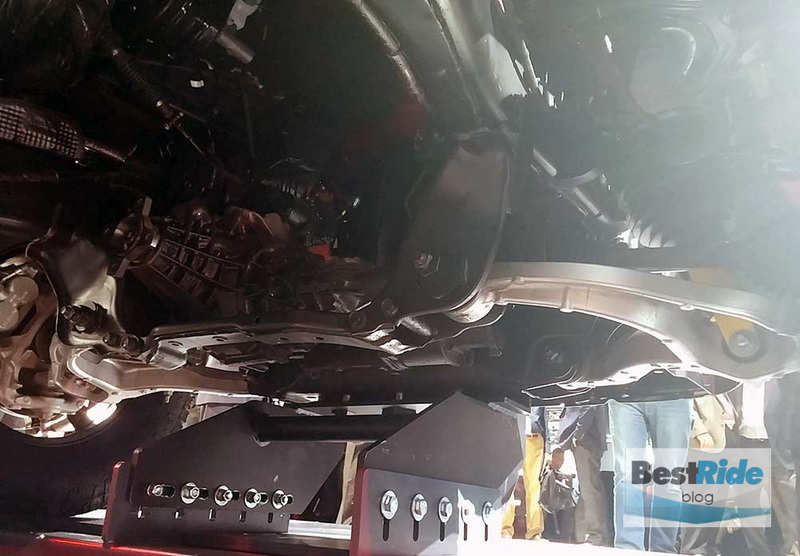 That 10.3-inch clearance is done partly by ekeing another inch of height out of the Ram’s air suspension. 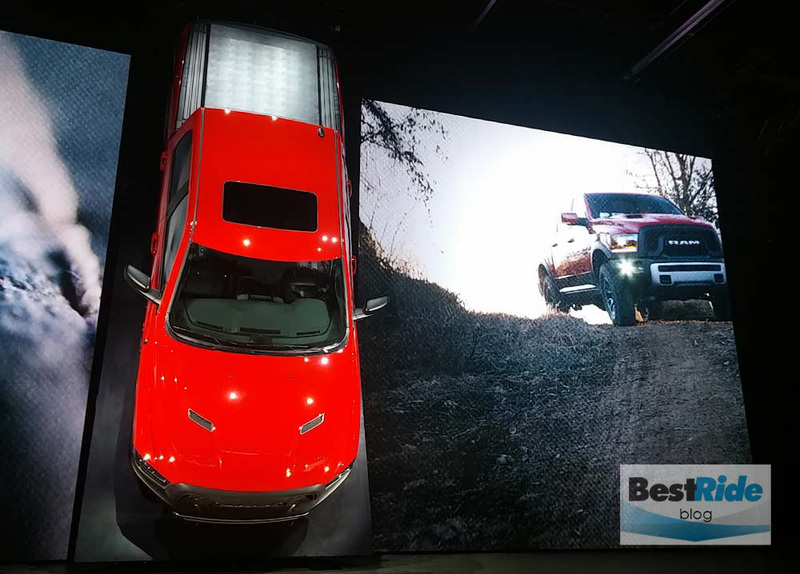 Bilstein shocks and a modified stability control are among the Rebel handling aids. 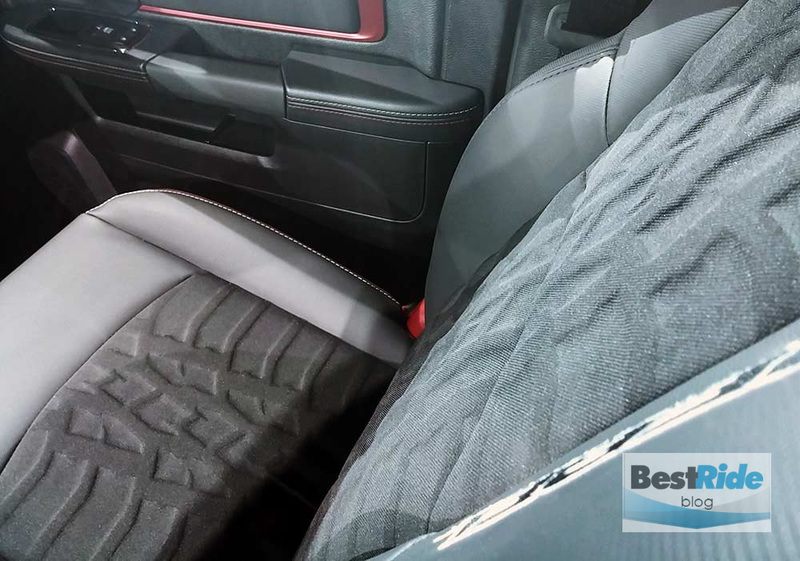 Chrysler’s Pentastar V6 or HEMI V8 are available (although a manual transmission is not), and despite the overwhelmingly off-road bent of the Rebel, you can have it in 4×2 trim. Those aluminum lower A-arms are lovely. Another Rebel exclusive is the tire/wheel combo. 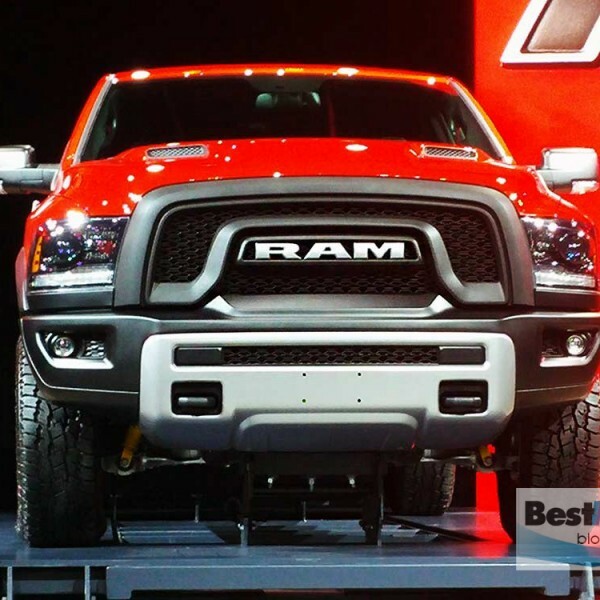 Wheels are 17-inch one-piece alloys, and they’re the opposite of the wide-open curb scrapers you can get on other Rams; these are snuggled within meaty 33-inch Toyo Open Country A/T tires. 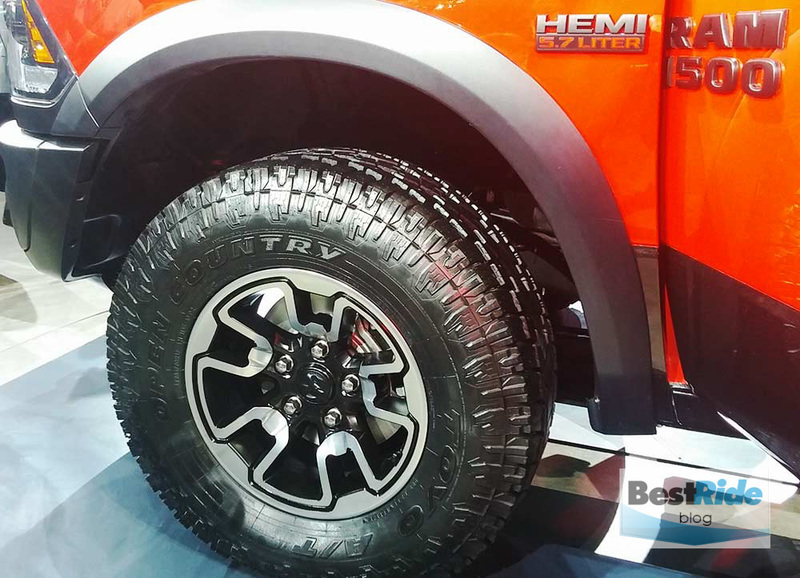 Those Toyo tires debut on the Rebel, and their tread pattern is ingrained into the upholstery. Hegbloom noted that this allowed the driver to sit on the Rebel’s footprint. …or the rear. 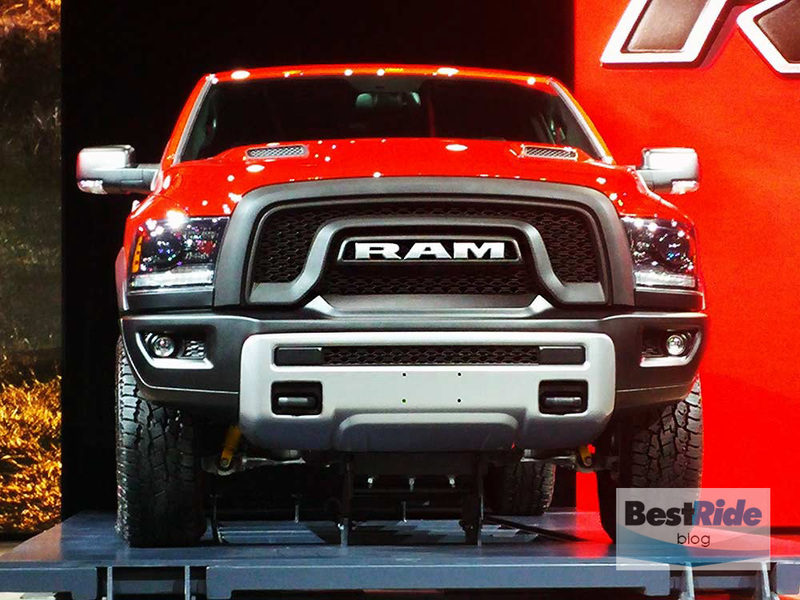 The tailgate screams it – RAM! 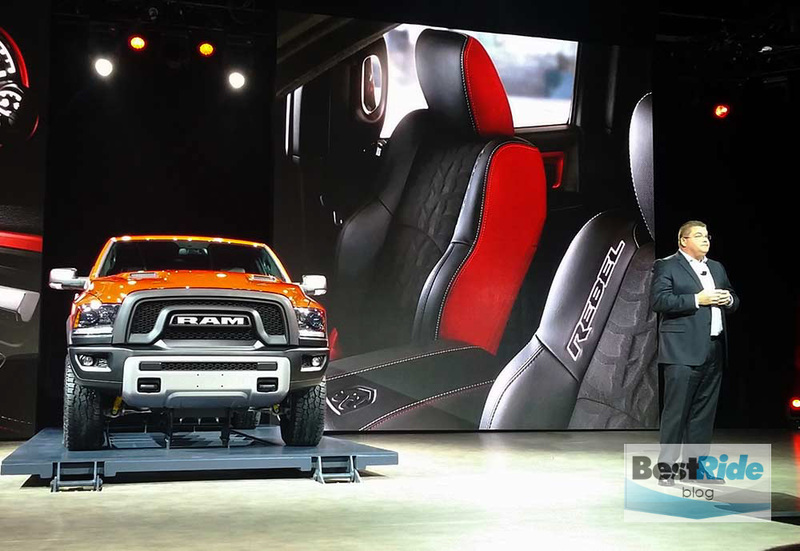 The Rebel is crew-cab only, with a 5-foot-7-inch bed. 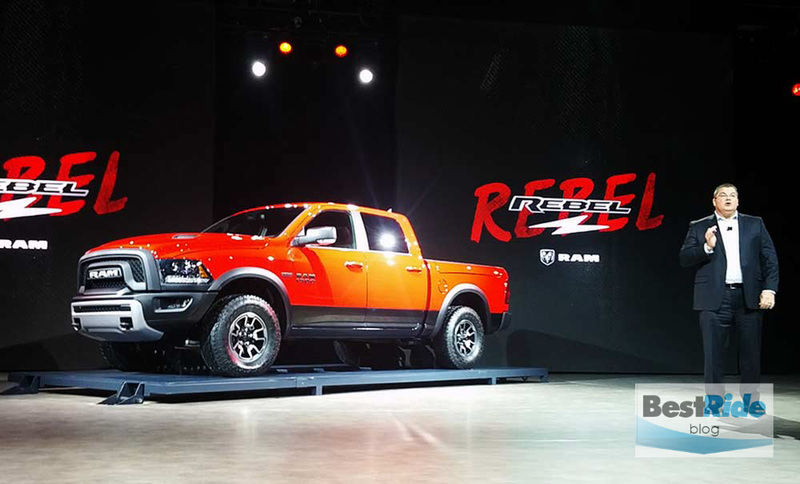 No doubt the Ram Rebel will create a stir with its styling and specs. 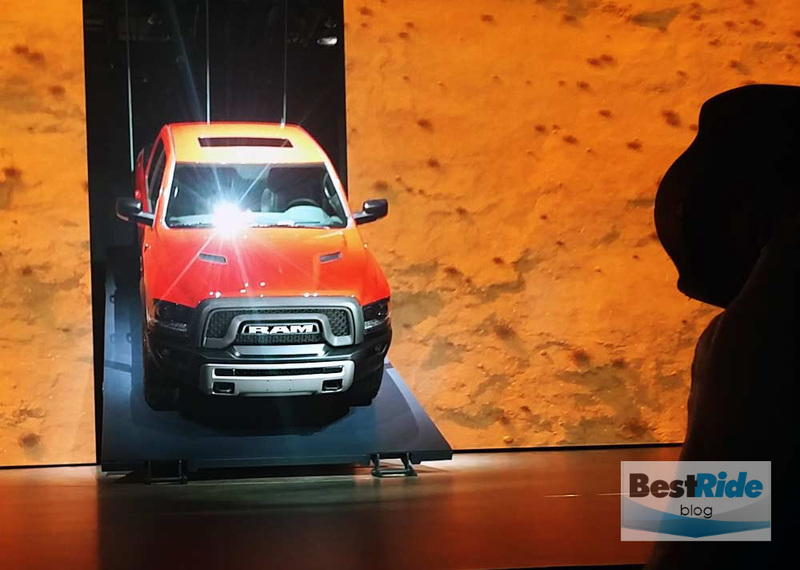 Tell us in the comments – do you think the Rebel will appeal to hard-core off-roaders? What Does This Button On the Ford F-250 Super Duty Do?